Even in unfamiliar territory, this show still makes as strong a case as ever for being the best comedy on TV right now. In this current TV landscape, for a comedy to survive to its third season, whether on broadcast or anywhere else, it needs to have built up plenty of goodwill. Whether from its characters, its premise, or some rabid fan base, that requisite enthusiasm is rare. So in the case of the NBC series “The Good Place,” it’s exhilarating to see a show use that momentum not to maintain some bizarre status quo, but to tear down its own structure and then expertly build it back up on almost an episode-by-episode basis. Watching that play out in Season 3 is no less thrilling than when it show regrouped after the massive shift leading into the start of the sophomore season. As hinted when we last saw Michael (Ted Danson), Janet (D’Arcy Carden), and the four humans destined to spend their post-life existence in a battle between good and evil, it seemed as though the show was headed back to Earth. Whether or not it would bring the same blend of the philosophical and the fantastical back to more recognizable sitcom setting was the biggest question mark. But even with the restraints of having to tell these character’s ongoing saga in a land where Biscotti Pippen is just a figment of someone’s imagination, and there are only slightly fewer frozen yogurt places, Season 3 opens up with a quartet of episodes that confirms that this group of cast and writers is equipped to make this story work wherever and whenever things may lead. The first prime example is how quickly the show brings the audience up to speed with everything that’s happened in the intervening time between since last we saw Eleanor (Kristen Bell), Chidi (William Jackson Harper), Tahani (Jameela Jamil), and Jason (Manny Jacinto). All four of them get explanatory sequences that show how they were able to prolong their time on Earth and what that extra time has done to their prospects of living a good life. That the show continues to find ways to keep these misfits in each other’s orbits, either thematically or physically, dovetails nicely with an ongoing thesis of the show — that ongoing human connection and understanding is not only possible, but necessary. Without leaning into sci-fi or more wonky multiple-timeline tropes, “The Good Place” has one of the most complex and fascinating relationships to time of any show on TV. 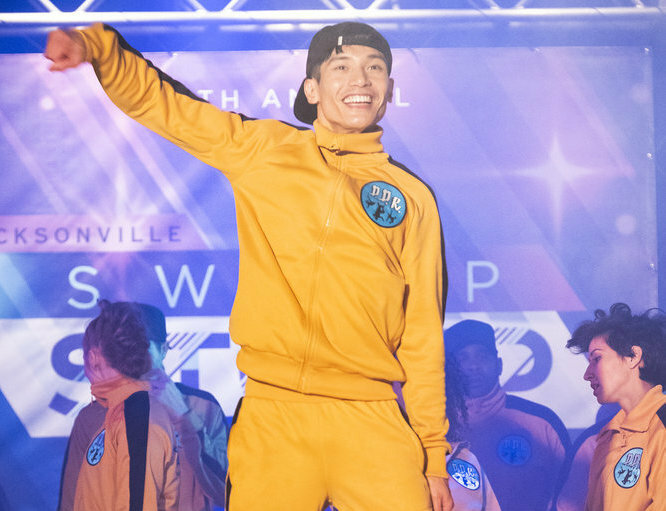 Following the endless resets of last year’s bonkers and masterful “Dance Dance Resolution,” in Season 3 the show is still not afraid to play with how much ground a single episode can cover. Essentially, as the framework of the show continues to be Michael tinkering with a massive experiment, the machinations of creator Michael Schur and writers like Jen Statsky (credited on both halves of a stellar season-opening two parter) come to fruition in just as satisfying a way. And the cast is just as game as ever to play along with all the different changes that the season brings about. By the nature of each of these characters’ second chances, the audience needs to see them weave through multiple versions of themselves with in a short amount of time. Some of these opportunities are more literal than others — our kingdom for a Ted Danson one-man show breaking down Michael’s acting process in character — but these swings work, whether they’re broad as intentionally horrific accents or as subtle as an eye twitch. Season 3 becomes something akin to the recent seasons of “Archer,” plopping beloved characters into environments so unfamiliar that they bring out the most well-defined aspects of each individual. (That even goes for not-a-robot Janet — aside from Danson, Carden is the one who gets the most comedic real estate to explore in these early episodes.) In the middle of these character remixes, “The Good Place” also finds a satisfying contrast between cosmic fate-of-the-universe forces and the smallest, most insignificant-seeming details. The idea that simple passions and foibles can come to mean so much in the context of trying to survive a tug-of-war this big only strengthens the impact of that message of connection. These new episodes aren’t all about forging new trails. Almost by necessity, the show has to return to some subject matter and joke fodder in well-worn territory. But the Arizona jokes, upper-class wordplay, and general Jason buffoonery don’t show any signs of drying up anytime soon. There are times when the framing device of why they’re back on Earth gets a little caught up in logistics — one of last year‘s most surprising characters works better as a one-off than a continuing part of the story — but there is such a palpable giddiness coming from everyone involved with the show that makes it uplifting and fulfilling all at once. Seasons 1 and 2 worked so well because they brought a recognizable bit of our world to something that had seemingly infinite possibility. Watching the show work the other way, bringing a bit of that surreal magic to the constraints of Earth, is a delightful reversal. Never knowing what’s coming next can be an exhausting process while watching a TV show. “The Good Place” takes that spirit of uncertainty and shapes it into something worth traversing time and space to enjoy. “The Good Place” Season 3 premieres Thursday, September 27 at 8 p.m. on NBC.